The end of my second term culminated with a collaborative project between Information Experience Design, The National Football Museum and The Cathedral School of St Peter and St John R.C. Primary. Our aim was to create a workshop or exhibit that demonstrated an area of ‘Forces’ from the National Curriculum to 11-12 year olds for Science and Engineering week. 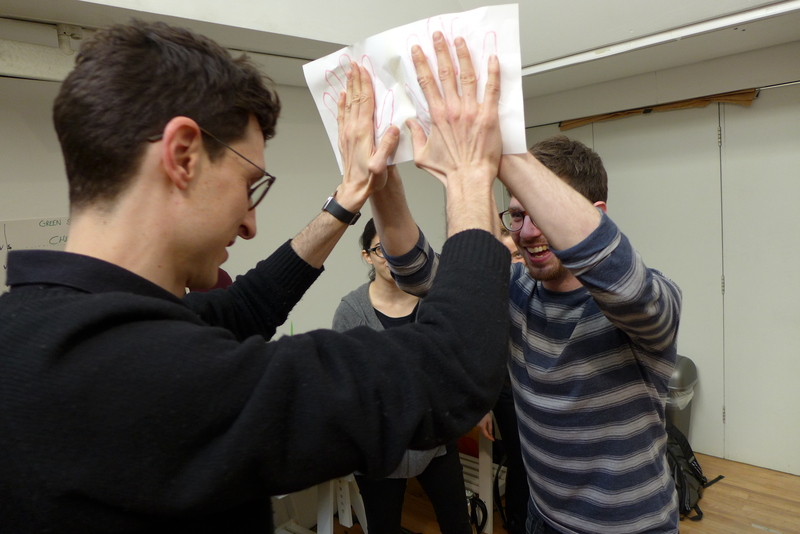 We designed a workshop and activity based on goal celebrations in which players pull their shirts off over their heads. We used the two surfaces moving against each other (the shirt and the body) to provide the basis for our demonstration of friction. Our workshop was based on four famous footballers celebrations, Ryan Giggs, Mario Balotelli, Cristiano Ronaldo and Zlatan Ibrahimovic. Each had a different characteristic (hairy chest, shiny undershirt, bulging muscles and tattooed torso) that could be replicated by participants in our workshop. The workshop involved transforming a string vest into a replica of one of these famous footballers. Once one of these vests had been completed it was then put onto a mannequins torso. On top of this the participant put on the 4m long football shirt we had created. We had two torsos and shirts allowing participants to compete and compare with their friends. The aim of the activity was to time how long it took to pull the shirt off from the torso and then to observe how the materials on the vest affected the time it took to remove the shirt. This activity section was carried out via the manner of a test with repeatability and fairness encouraged. The final section was styled as a post match interview and encouraged the participants to reflect upon their experience and suggest which materials had what affect as well as to critique how the activity could be improved to find out more. Our approach to this was to create an active learning environment. We were keen for the process to attract as much as involvement as possible from the participant. This led to the development of the creative part of the workshop in which participants crafted part of kit for the activity that was to follow. We also decided to push the absurdness of the activity. The 4m long football shirt helped provide both an initial pull of curiosity and to extrapolate the effects of friction in the activity. Through the development of this project we worked on co-design toolkits to allow input from the students we were designing for. We created an open-ended toolkit that required students to try and push the boundaries of what a museum should be. We were conscious to try and draw out both imagined limitations as well as imagined possibilities of the museum space. Using these twin provocations allowed us to see beyond traditional exhibit design and to try to lose some of the barriers to participation that are associated with large institutions. 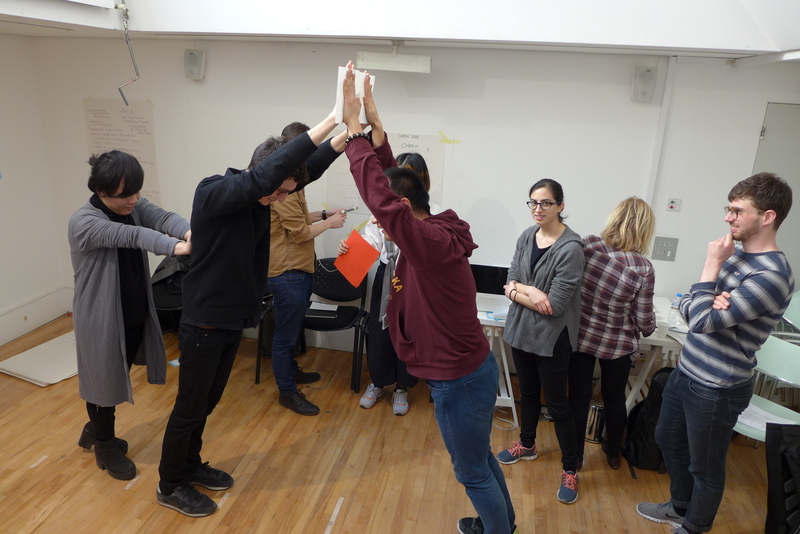 Workshops with ReachOutRCA and play specialist Isabel Fróes were hugely helpful in enabling our project to explore new ground in terms of practice and methods. This project was taught me a lot about some of the issues around co-design and working on multiple stakeholder projects. As a student I always look to challenge assumptions and expectations, this becomes a more challenging task when working with schools and museums. However the ability to create work that was purposed designed for and then used in a direct experiential way was really exciting. I loved the situation in which surprise, anticipation and learning could be layered up together and then experienced in a guided but ultimately free and fun way. I am certainly very keen to carry on developing participative methods in my design practice and also in my outcomes. I think there is a necessity for provocative, exciting and interesting ideas to be made not just accessible but attractive and empowering to their audience- an audience that should be as wide in scope as possible.